Carolina Concealment & Defense is located in Nash County, NC. 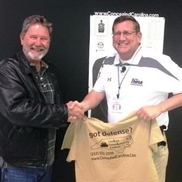 Dedicated to safely training the public on firearm use and ownership, Carolina Concealment & Defense sets you up for successful firearm ownership through knowledge and experience. Explore our website to learn about our NRA Certified Firearms Instructor, (Charles R. "Charlie" Mayo), Our NRA classes, and our NC concealed handgun permit classes. Save $10 on your annual NRA membership here!